Knowing Zimbabwe’s political and governance history, you will forgive me for attending a workshop hosted by CIPE’s Compliance Training Partner, Latilla Investments, with very low expectations about how interested participants would be in this subject matter and how little awareness or expertise there would be about corporate anti-corruption compliance. This is because in my experience, countries with somewhat similar histories of long-term dictatorship—in Zimbabwe’s case, 37 years of coopted institutions serving a small group of privileged elites—is the perfect recipe for a culture of high tolerance for corruption permeating the corporate culture. Therefore, compliance tends to be of the lowest priority for companies of all sizes. CIPE Trainer Susan Mutangadura (left) and CIPE Program Officer for Africa Lola Adekanye (right) participate in a recent two-day CIPE workshop on Ethics and Corruption Mitigation for companies in Harare, Zimbabwe hosted by Latilla Investments. Mark Oxley, author of “A Director’s Handbook,” and Susan Mutangadura, former head of compliance at Zimbabwe’s Revenue Authority and former chair of the Zimbabwe Institute of Directors— both CIPE-accredited anti-corruption compliance consultants—facilitated the recent two-day CIPE workshop on Ethics and Corruption Mitigation for companies in Harare, Zimbabwe. I attended to provide oversight and co-facilitate the workshop but really to be a fly on the wall. Zimbabwe’s ranking as 157 out of 180 countries in Transparency International’s 2017 Corruption Perception Index is reflective of the country’s weak governance institutions characterized by widespread corruption across all sectors of society, which impedes business growth and economic stability. A 2016 Corruption in Business Survey conducted by the Center for International Private Enterprise (CIPE) highlighted many reasons why Zimbabwe also scores poorly (155 of 190 economies) on the World Bank’s 2019 Ease of Doing Business ratings. CIPE’s report exposed extensive red tape, bottlenecks, rent-seeking, and an entrenched system of political patronage that usurps the prospects of growth in a free and competitive market. Between 2000 and 2015, the cost of corruption to Zimbabwe’s economy was estimated at $1 billion USD a year, according to the October 2016 State of Corruption Report by Transparency International Zimbabwe. In the diamond sector alone, due to collusion between private companies and corrupt government officials under opaque deals, instead of generating $600 million USD as expected in annual tax revenue, only $100 million USD was remitted per year. This loss of $500 million in potential tax revenue undermined the government’s capacity to strengthen the economy. The report shows that while running a business in Zimbabwe without state patronage—in other words, subscribing to corrupt alliances with government officials—could be financially rewarding to a business, it comes at a price. Corruption can cost companies their credibility, international investors, and the freedom to run their businesses without interference from corrupt officials who become shadow partners and can coopt business for corrupt and even nefarious purposes. Breaking this alliance is costly for business owners as well. On the other hand, entrepreneurs who have excelled without corruption and predation often feel so insecure at home that they live in self-imposed exile or operate on a small scale and under the radar. The CIPE survey exposed several detrimental, yet common practices and norms that distort the market and at the same time expand opportunities for rent-seeking, bribery, and extortion. Businesses consistently face subtle and aggressive demands for bribes that often occur in the context of missing files due to poor organization and filing of official documents. Considering that poorly defined processes, unexpected or unexplained changes to processes, tariffs, and official fees are common across regulatory agencies, it seems to be a calculated strategy to encourage unofficial transactions at the expense of businesses. As the CIPE survey argued, corruption is a consequence of public service inefficiency, since businesses may be able to justify paying a lower cost in bribes for getting a service than waiting throughout the inefficient and sometimes uncertain process. The deterrent for companies in this case would be the fear of law enforcement. However, in Zimbabwe, there is no such fear. The combination of public service inefficiency and the lack of enforcement of anti-corruption laws creates a thriving and enabling environment for businesses to participate actively in the market of corruption. Therefore, as I attended the Harare conference under the auspices of CIPE’s Africa anti-corruption compliance project, my expectation was to find that companies would have little or no interest whatsoever in learning about mitigating corruption. This is one time I can say I was glad to be wrong about my assumptions; there was certainly more awareness about the importance of compliance than I anticipated, at least among the participants that comprised small, mid-sized and a few large companies. Compliance officers representing companies in diverse industries, including a state-owned enterprise, exhibited a relatively functional level of compliance expertise that sparked my curiosity. To satisfy my curiosity about this dichotomy of high levels of compliance awareness and mitigation capacity versus a high tolerance for corruption and lack of compliance culture in Zimbabwe’s business environment, I went about asking questions of the participants, and it turns out that the high ethics and compliance standards of investment partners in Germany require similar levels of compliance in Zimbabwe. All the participants were remarkable in their commitment to learning about ways to change the culture of their various organizations, but investment firm Takura Capital and banking institution Old Mutual Capital stood out to me in particular. Takura Capital, a local private equity firm dedicated to investing in Zimbabwean companies, captured my interest because it had not only implemented thorough ethics and compliance protocols, but it had also invested in passing these high compliance standards on to their subsidiaries. The bulk of Takura Capital’s investment capital comes from the German Investment Corporation (DEG), enabling the firm to invest in about 22 local Zimbabwean businesses. DEG requires Takura to maintain an Environment, Governance and Social Impact Assessment and mitigation plan, making Takura responsible for ensuring that its third parties meet these standards. Given the high levels of corruption and low capacity for implementing compliance standards, Takura’s compliance unit not only conducts extensive due diligence before investing in companies, but it proactively provides compliance support to the companies in its portfolio to limit its third-party risk. As papers flew across the room, with teams populating risk assessment charts during one of the working group sessions, I gathered from Takura’s compliance officer that she had invited CEOs and other executives from five of its third-party businesses to attend the workshop as well. She was taking extensive notes to apply to the training modules for the compliance officers and executives of the companies in the firm’s portfolio. Keeping an open feedback loop on compliance with these companies enables Takura to proactively respond to particular compliance issues that these companies encounter. For instance, when logistics companies in Zimbabwe faced high incidences of bribery taxes paid at police check points multiple times a day, causing delays and financial losses, the affected companies—most of which are in Takura’s portfolio—led a collective action group to tackle this form of corruption. This collective action group provided a service that attached GPS trackers to clients’ trucks so that they can monitor stops at police checkpoints for unusual delays. Once an unusual delay is picked up, the collective action unit deploys a team of staff that could include legal personnel to represent the clients. Companies in Takura’s portfolio remark that being a Takura subsidiary gives them a reputation as incorruptible customers to corrupt officials. Recording the positive impact of cross-border influence on corporate compliance, I would be remiss not to mention how Old Mutual, a bank headquartered in South Africa, is changing behavior amongst employees in Zimbabwe and mainstreaming compliance in the banking sector. A compliance officer from the Old Mutual branch shared insights about the advanced compliance program it has implemented in Zimbabwe because of its regulatory exposure in South Africa and by extension from international affiliations. Old Mutual’s compliance team has addressed complex compliance challenges in the Zimbabwe context, advancing the level of discussion to cover compliance grey areas like how to implement a gift policy in a culture where gift giving is common. How would you categorize a luxurious boat ride, which is a common treat for executives in Zimbabwe, sometimes for legitimate business purposes? While Zimbabwe currently has poor corruption rankings, the corporate space may be moving in a positive direction. This is significant because it is having a broader impact on employees and society. Employees are becoming more sensitive to what constitutes unethical behavior due to training and awareness created by compliance programs. Companies deal with customers more ethically and engage in collective action involving other stakeholders. Old Mutual employees are known to be among the few who turn down customers soliciting corrupt transactions and offering bribes. Takura’s third parties have a reputation for being uncooperative with corrupt officials and are respected in business associations and similar gatherings, giving them a voice to influence their peers. Therefore, when Zimbabwe’s political will to combat corruption kicks in, the country will have a pool of experienced compliance officers to turn to for guidance on designing systems for mitigating institutional corruption. Zimbabwe and other emerging economies have much to gain from reducing corruption, including millions of dollars in increased tax revenue to improve public services, improved rule of law, economic growth, and increased stability. For now, policy makers in the West (Europe and the United States) should be credited for small gains taking place in Zimbabwe and should know that indeed, efforts to set global standards and norms on corporate ethics and integrity are having a real impact even in difficult environments. International policy makers should not relent in providing leadership, setting good examples, and following through with good policy initiatives to reduce corruption and advance transparency and accountability at home and abroad. As global norms against bribery spread and anti-bribery laws become increasingly enforced, companies seeking to integrate into global value chains must implement best practices for mitigating corruption. 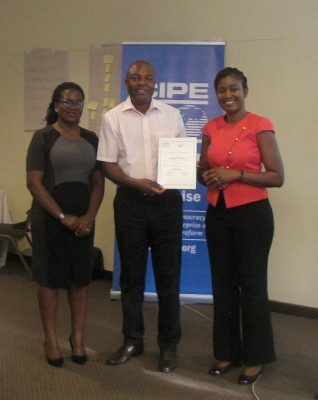 Therefore, as part of CIPE’s Africa regional strategy to empower businesses to combat corruption, CIPE is equipping local companies in over 12 countries across Africa with compliance tools and resources to mitigate the risk of corruption in their operations and supporting efforts to mainstream ethics and integrity in the business environments in these countries. Through CIPE’s support SMEs are able to understand the cost of corruption to their businesses and implement mitigation protocols making them less risky investment partners for international investors. Lola Adekanye is a Program Officer for Africa at the Center for International Private Enterprise.